Posted: March 27, 2010 8:37 p.m. Updated: March 29, 2010 4:06 p.m.
A group of classic cars make the return trip on the northbound side of the cross-valley connector. 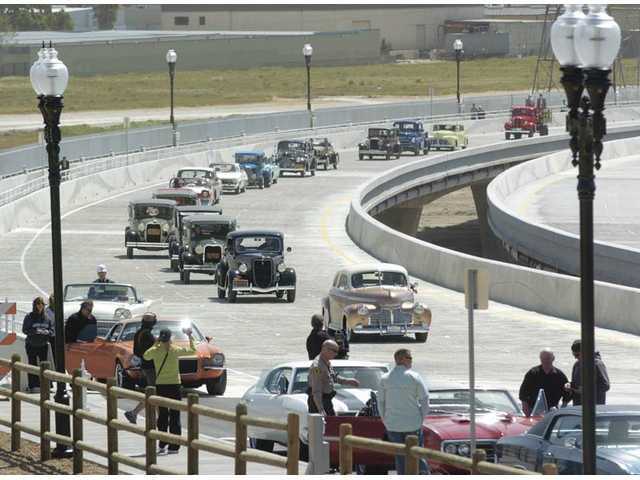 A group of classic cars make the return trip on the southbound side of the cross-valley connector. Contractors C.C. Myers built the bridge over the Santa Clara River to complete the cross-valley connector, which oppened to traffic Saturday. 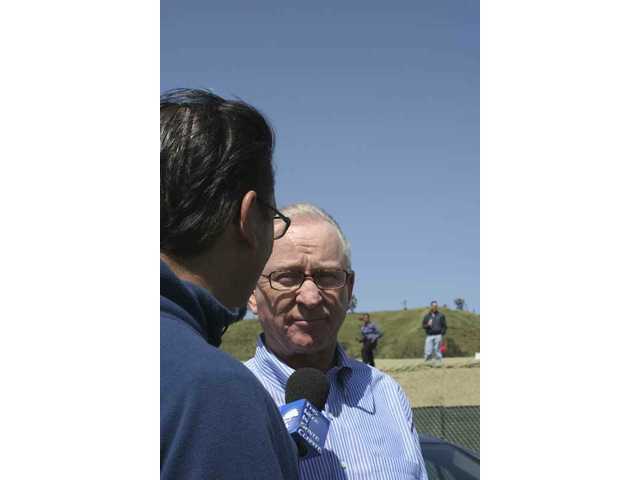 Evan Thomasson of the city of Santa Clarita interviews Congressman Howard P. "Buck" McKeon (R-Santa Clarita) during the cross-valley connector bridge opening on Saturday. Santa Clarita Velo member Tom Barron was one of the first bicyclists and Duane Harte and his wife Pauline were the first motorcyclists to cross the bridge over the Santa Clara River at the cross-valley connector opening on Saturday, March 27. 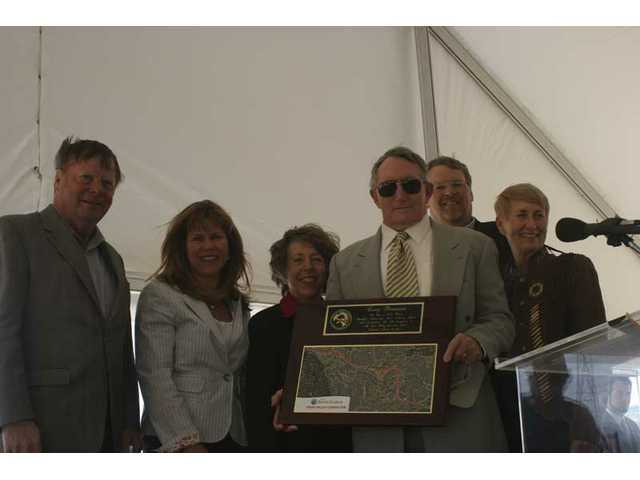 Centre Pointe developer Larry Rasmussen recieves a commemerative plaque from (from left) Santa Clarita City Councilman Bob Kellar, Councilwoman Laurie Ender, Mayor Pro-tem Marsha McLean, Councilman Frank Ferry and Mayor Laurene Weste during the cross-valley connector opening ceremony Saturday. 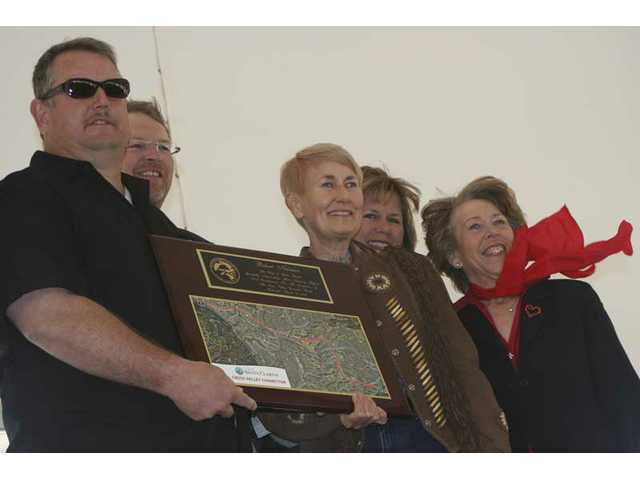 City of Santa Clarita Public Works Director Robert Newman (left) receives a commemerative plaque from City Councilman Frank Ferry, Mayor Laurene Weste, Councilwoman Laurie Ender, and Mayor Pro-tem Marsha McLean during the cross-valley connector opening ceremony Saturday. 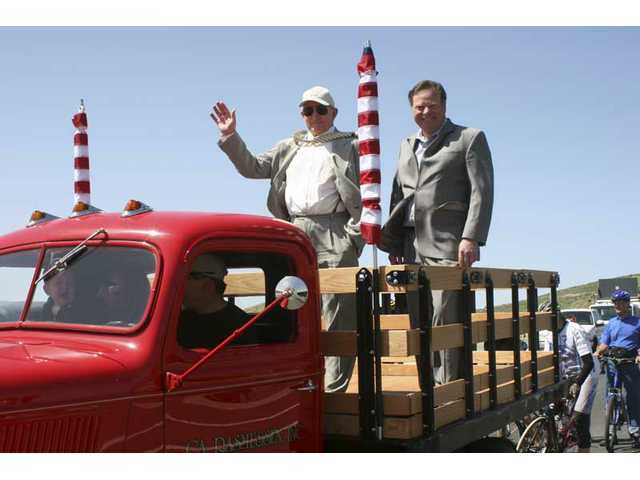 Centre Pointe developer Larry Rasmussen (left) and Santa Clarita City Councilman Bob Kellar ride in the bed of a restored stake bed truck. 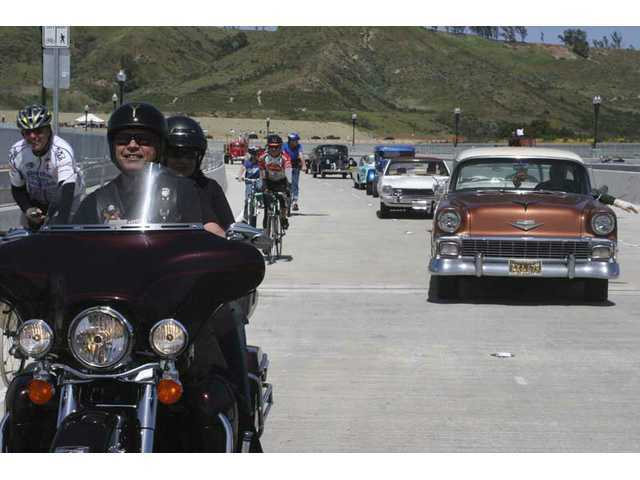 It was among the classic vehicles that were first to cross the bridge across the Santa Clara River after it was dedicated Saturday. 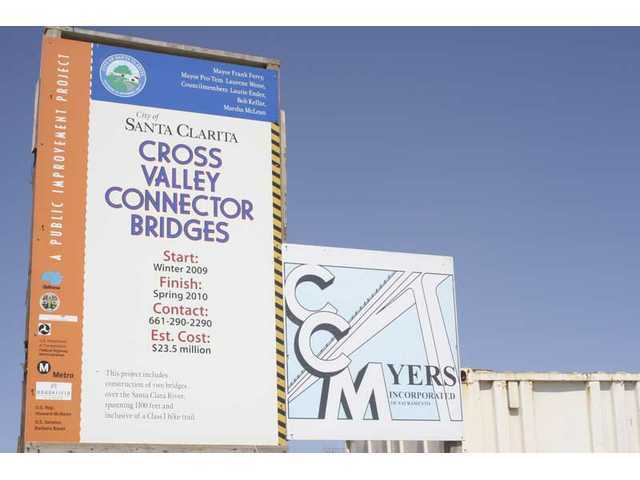 The Foster family from Castaic was the first to walk across the cross-valley connector bridge over the Santa Clara River Saturday morning. From left: Rhonda; Atticus, age 3; Nigel; Ashton, age 5; Chloe, age 9; Aiden, age 7; and Caroline, age 9. Dignitaries lined up to cut the ribbon opening the cross-valley connector's last link. From left: Dave Perry, Antonovich Rep.; Ken Pulskamp, city manager; Scott Wilk Jr., Tony Strickland Rep.; Bob Kellar, city councilman; Larry Rasmussen, head of Spirit Properties; Laurie Ender, city councilwoman; Congressman Howard P. "Buck" McKeon; Laurene Weste, mayor; Greg McWilliams, president of Newhall Land & Farming Co.; Marsha McLean, mayor pro-tem; Frank Ferry, city councilman; Connie Worden and Dennis Kootz, former council member. 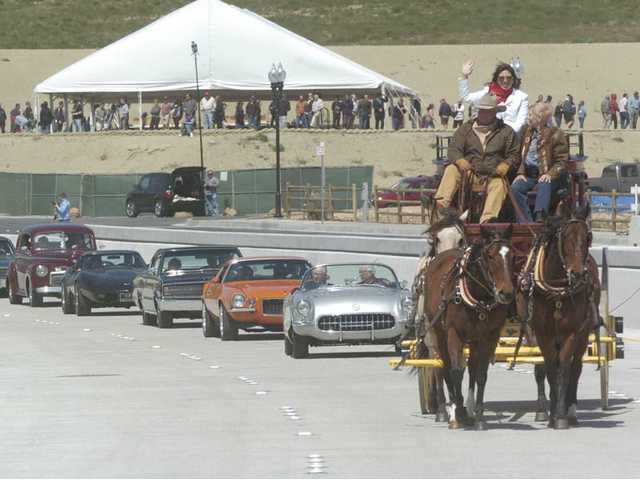 The Wells Fargo stage coach, driven by George Lane and carrying Wells Fargo Senior Vice President Robbin Preciado, waving, and Mayor Laurene Weste, is the first vehicle across the cross-valley connector bridge, followed by classic cars as spectators watch from the ceremony tent above at the grand opening ceremonies on Saturday. 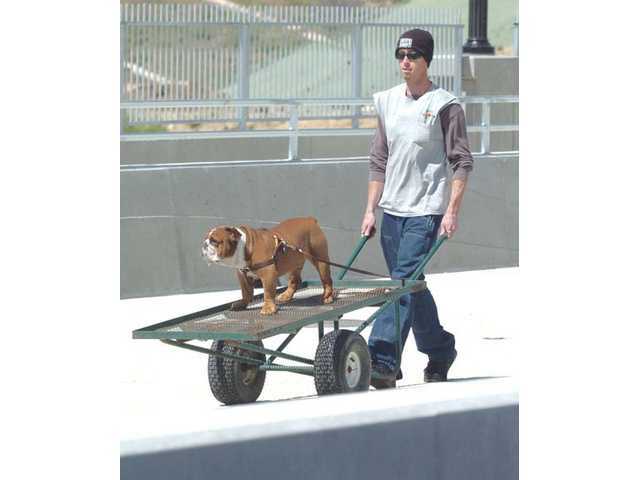 James Green and Tank are the last to cross the bridge at the grand opening ceremonies. 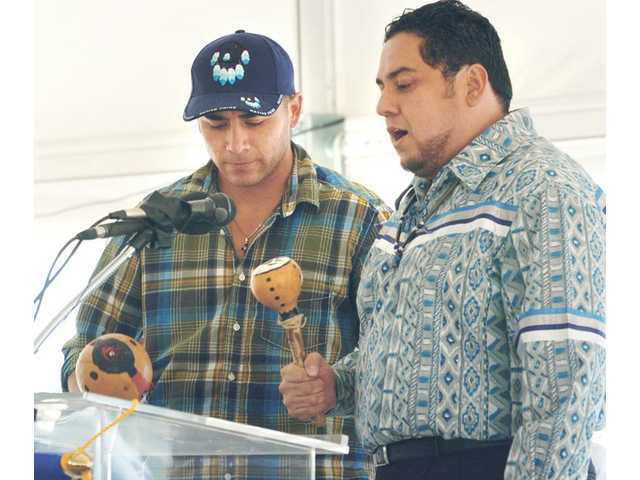 Isaac Gonzalez, left, and Rudy Ortega of the native Tataviam tribe sing the “Song of the Bear” as a blessing at the cross-valley connector bridge opening on Saturday. An hour before the final piece of the cross-valley connector opened, the 1,100-foot-long bridge over the Santa Clara River looked more like a car graveyard than the long-awaited super road it is being hailed as by officials. Residents parked hundreds of cars along Golden Valley Road near Valley Center Drive as they waited for the road to open. Wind gusts kicked up large plumes of dust and pushed tumbleweeds across the road while they waited. 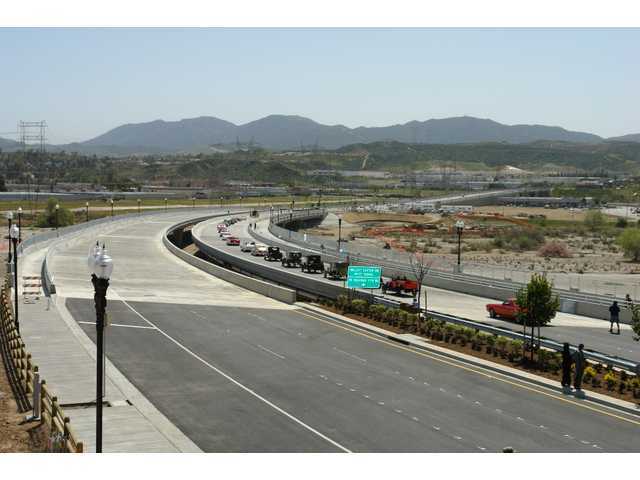 Between 600 and 700 people came to a ribbon-cutting ceremony and parade Saturday to commemorate the completion of the $245 million road joining Interstate 5 and State Highway 126 on the west and Highway 14 freeway on the east. The 8.5-mile road, which took about 10 years to finish, is expected to significantly reduce the time it takes some residents to get across the SCV, said Mayor Laurene Weste at the ceremony. The final section connects Golden Valley Road with Bouquet Canyon Road and Newhall Ranch Road. The bridge over the Santa Clara River has six lanes, two sidewalks and a bike path, she said. Officials representing Sen. Barbara Boxer, D-Calif,, Los Angeles County Supervisor Michael D. Antonovich and State Sen. Tony Strickland, R-Thousand Oaks, all spoke at the event. 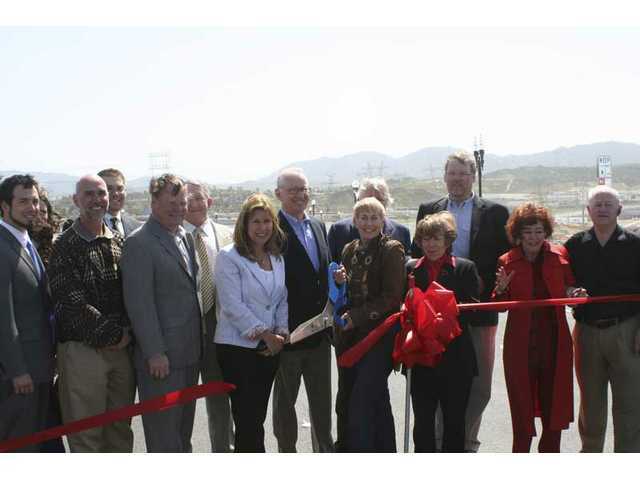 Little more than $26 million in federal funds were used to build the roadway that is about a half-century in the making, said Congressman Howard “Buck McKeon, R-Santa Clarita. 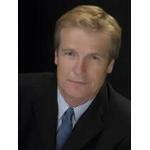 “We moved out here in 1964,” McKeon said. “As we were buying our home, you go to the sales office and they explained to me the cross-valley connector would open the next year,” the crowd laughed. “I guess it’s 1965,” he said. 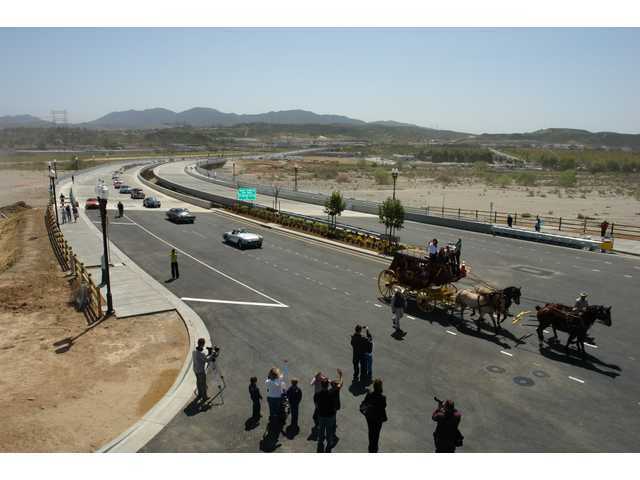 After the ceremony ended, officials held a parade over the new bridge that was lead by a covered stagecoach pulled by four horses and about 30 classic cars. Looking like a space-aged construction worker, John Buccola of Valencia streamed the entire event live on SCV Talk, a local blog. With the help of a black laptop, wireless Internet card — and by attaching a small webcam to a white construction hat — Buccola, 32, turned his head into a makeshift broadcast station. Buccola rode in the backseat of a blue 1958 Ford Skyliner and documented his 5 mph trip across the bridge. He said 123 people tuned into his stream to watch the event live on their home computers. “It’s a bit surreal watching the recorded stream post-event,” Buccola wrote on the blog after the parade.